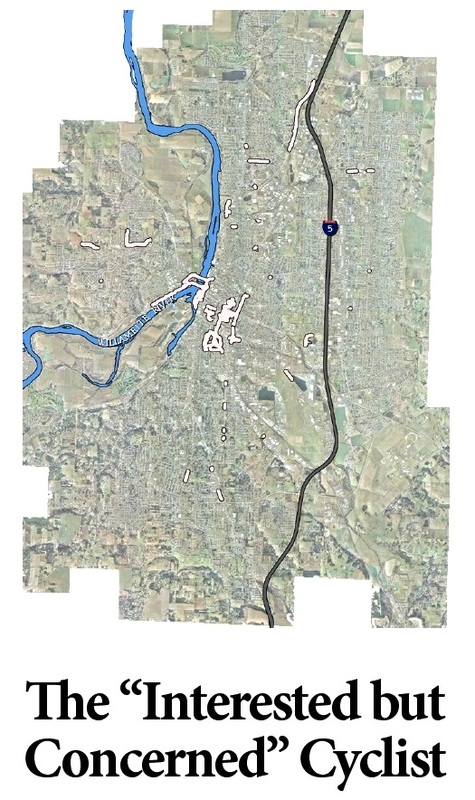 Among the reports in the Sustainable Cities Initiative Downtown Parks Connectivity Analysis is "Accurately Modeling Salem’s Bike Network in ArcGIS" by Michael Duncan, Kory Northrop, and Ted Sweeney. bicycle routes along the parts of roadways where bicycles actually travel, and measures the level of fear associated with each section of the bicycle network. The dataset can be used to compare cycling routes through the city based on how scary they are, which can help guide infrastructure investment to increase the comfort levels of all bicyclists. One of the most interesting graphics in the study was a summary of Salem's bike network by its usefulness to different kinds of riders. represent the majority of the general population. 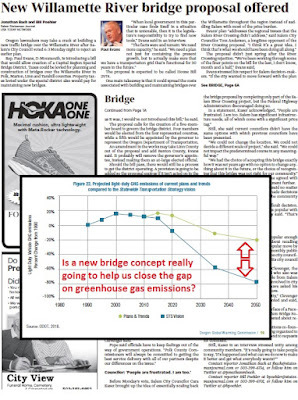 They likely rode a bike during childhood and may ride for recreation, but they hold concerns about riding on major streets with higher vehicle speeds and volumes. Riding on residential streets is a possibility, but these riders typically wouldn’t ride on or across major streets without bicycle infrastructure. Click through to enlarge it (especially as it is marked in light beige), but yeah, it's dinky. It's a collection of paths, too disconnected to call a network. You can't get anywhere with it. Even the middle network isn't fully connected. 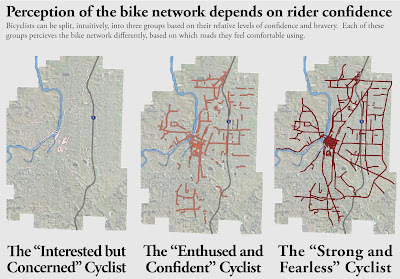 This network might appeal to the "enthused and confident,"
the majority of people who bike regularly. These cyclists typically prefer to ride on streets designed with bicyclists in mind (e.g., streets with bike lanes). the smallest portion of the bicycling population, [who] are comfortable bicycling on almost any road (regardless of roadway condition and presence of bicycle facilities). 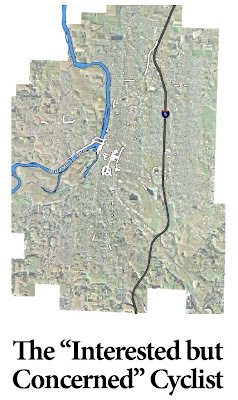 Salem lacks bicycling facilities in a meaningful network for regular people. Save the date, Tuesday, November 1st. There will be a public hearing on the new Bike Plan, and it'll be important to let folks know why it matters. Thanks to the Breakfast Sponsors!